4/16 Cup of Coffee: Starting pitchers shined across the organization Friday, with all four levels seeing starters toss 5 innings or more and allow two runs or fewer. 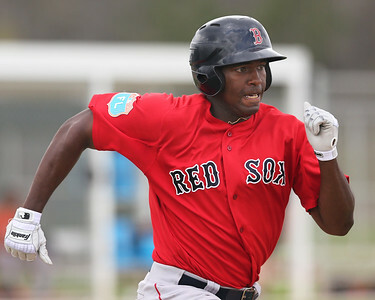 Rusney Castillo had a welcome return to the minors, and fellow Cuban Yoan Moncada had a difference-making night in Salem. Josh Ockimey (pictured) smashed a home run to lead the way for Greenville. The only team to lose, Portland, did so after 17 innings of baseball. Five different PawSox collected two hits, as the team built an early lead and hung on for a 6-5 victory. In his first Triple-A at-bat of the season, Rusney Castillo ripped an RBI double to get the PawSox on the board in the first and later added an RBI single. With a pair of runs in the fourth and sixth, the PawSox offense, which had struggled this season before an outburst Thursday, pushed the lead to 6-2. Chris Marrero followed up his four-hit performance on Thursday with two doubles on Friday, adding a walk and scoring a run. Deven Marrero, Justin Maxwell, and Sandy Leon each chipped in a pair of hits. William Cuevas provided a solid outing, notching his first win of the season, tossing 6 2/3 innings of two-run ball. Anthony Varvaro continued his strong start to the season by setting down all four batters he faced in relief, but Kyle Martin ran into trouble in the ninth before Jorge Marban retired the final batter to pick up his first save. The Sea Dogs came out on the losing end of a marathon that tied for the longest game in the team's history. Tied 1-1 after nine innings, the pitchers' duel continued into extras, where each team pushed across a tally in the 13th. Hartford finally broke through for three runs in the top of the 17th, and the Portland bats could not respond. Teddy Stankiewicz started on the hill and tossed a quality start of six innings, three hits, and one run. Mike McCarthy and Chandler Shepherd followed him and combined to throw five shutout innings. Simon Mercedes allowed the three 17th-inning runs and took the loss. Portland did not mount much of an offense all night, mustering just one extra-base hit in the game. Tzu-Wei Lin drove home the first run and scored the second as part of his 3-for-8 night while Wendell Rijo doubled and scored. The top of the Salem lineup did most of the damage, as the squad edged Winston-Salem in a low-scoring affair. To get Salem on the board, Yoan Moncada swiped home plate in the third inning as part of a successful double-steal attempt with Andrew Benintendi, who stole second. The prodigious pair posted identical 1-for-3 nights, each knocking a double, though Benintendi did also walk once. Nick Longhi plated Benintendi with an RBI single later in the third, but a Moncada sacrifice fly in the 7th inning turned out to be the difference. Mike Meyers picked up a pair of hits, including a triple that set up Moncada's sac fly. Jalen Beeks secured the win on the hill, throwing five innings and allowing one run. Yankory Pimentel and Austin Maddox preserved the win out of the bullpen, as Maddox earned his second save of the season. Timely hitting and patience at the plate allowed the Drive to turn seven hits into eight runs in a blowout of the Fireflies. First baseman Josh Ockimey blasted his second homer of the season to break a 1-1 tie in the third inning. Greenville really broke things open with a five-run sixth, which included three walks and a two-run home run by Trent Kemp. Ockimey, Chad De La Guerra and Joseph Mongue each reached base three times in five trips to the plate while Luis Alexander Basabe and Austin Rei each drew a walk and scored a run in hitless nights. Roniel Raudes moved to 2-0 on the young season with a five-inning start in which he allowed only one run and struck out four. Reliever Jake Cosart was knocked around a bit, giving up two runs on four hits in 1 1/3 innings. Player of the Night: On a night in which the only player with more than two hits (Tzu-Wei Lin) had eight plate appearances, offensive balance reigned. Josh Ockimey's power and on-base display earn him Player of the Night. The Greenville first baseman pulled a home run, punched a single up the middle, and worked a seven-pitch walk. The Red Sox are hoping that Ockimey, a 2014 fifth-round pick, can unlock his plus power potential after he hit four home runs across 311 at-bats the last two seasons. The big lefty already has two in 29 at-bats this year and has increased his walk rate in the early going as well.